UJET provides a customer interaction platform designed to improve customer support by helping companies resolve problems faster. "UJET, the first Smart Cloud Based Telephony Provider"
UJET works best for us for 3 reasons: 1) it's reliable in it's providing of high quality voice and does NOT go down, 2) UJET provides a smart customer and agent facing interface that gives more information faster than ever before, and 3) UJET is easy to us and doesn't require constant administration. UJET is a simple solution that's easy to use. As part of that, it appropriately sacrifices some individual administration customization. Fortunately, none of it prevents full usage or expectation of a telephony provider. UJET is the only provider I know that is improving its system and product offerings as quickly as our own company. As such, they're the only company that can keep up. UJET empowers our customer service team to reliably and easily connect with our customers. In particular, we have a unique customer situation that requires immediacy, speed, and clarity, and UJET quickly delivers all 3 better than any other current telephony provider. "Intuitive Softphone for Growing Companies"
UJET provides our agents with a beautiful, intuitive interface that makes their job much easier. With the simplicity of its design, UJET becomes an unobtrusive tool that agents don't have to think about while they use it, which allows them to focus on what really matters: taking care of our customers. As a manager, I wish I had an easier way to search for a group of agents on live calls. UJET also frequently freezes when I am trying to listen to live calls. This is great for a start up company. They are still growing and adapting to our needs, which is awesome. UJET has streamlined our internal transfer process, saving our agents and our customers time. "Easy to use but powerful"
"Ujet has been a welcomed and much anticipated upgrade to our telephony system"
I love the simple interface and how easy it is to use. All the functionality of a robust telephony system put into a simple and beautiful design. I do wish that my team could have personalized extensions. With the nature of our business, it'd be easier to assign extensions to numbers rather than give individual numbers out. Be sure to make a map or diagram of how you would like to build out your phone system. With all of the customization options available, it can be difficult to setup if you do not have a plan or phone tree. We are finding ways to make sure our customer's are able to get to the correct destination to receive the help and gather the information that they need to either fix an issue or make an informed decision when purchasing our products. "Quirky, suited for small businesses"
They have consistently taken our feedback and implemented it where they can. I like how easy it is to change any admin settings or queue settings. Setup was incredibly easy. Pricing is great! Not optimized for large contact centers - no true omnichannel admin panel yet so i have to keep multiple tabs open in order to see whats going on across our small center. No extensions, just direct lines. Give feedback regularly, take advantage of their CSM reach outs and meet regularly to resolve issues, get clarification and provide feedback on your usage. They really listen! We were able to highly customize our user experience with ujet and have enjoyed the roll out of the chat feature as well. Very excited about the sms feature. "Seamless and easy integration using UJET APIs"
We partnered with UJET to serve the needs of our mutual customers. As a Workforce Management provider, we integrate with dozens of CCI, CRM, and telephony providers to get real time data about call history, real time agent activities (real time adherence), and agent performance stats. The integration with UJET was seamless and very easy to implement. We have completed the integration in a record time and were pleasantly surprised to find that UJET's REST API are well documented, flexible, and provide rich set of data. The technical support from UJET was flawless although rarely needed. The integration with UJET API enables Monet Software to collect call history, real agent adherence status, and agents performance stats in order to forecast workload, create optimized schedules for agents, and provide performance management tools for contact centers. "Incredible product & service that improves agents, supervisors and users experiences"
The agents are able to improve their level of support and the supervisors are able to measure and control things that they didn't have visibility into before Ujet. Also, the user has a totally new experience with sharing video, screens and a flexible IVR. Users are seeing an increased number of cases being solved during the first contact which was a key metric for the agents. Customer service from Ujet was critical in getting the organization up and running in a short period of time and it couldn't have been done without such great support. Sales process was bumpy given deadline pressure. Also, not sure if this is entirely on Ujet or also on the company too, but it would be great if the agents could use a wireless headset to improve their working experience. Have one of their team do a demo and you'll be fully convinced. By decreasing the number of contacts requires to solve issues the company is improving the economics of the contact center and also the image and PR of the support that the company's product receive. Also, the company is starting to track how who is responsible for the tickets generated (product design, product implementation, technical team, etc.) and thus are able to improve on the product life overall. 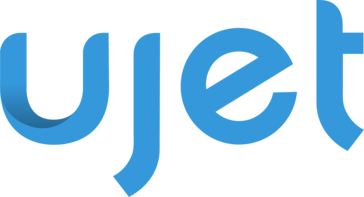 "Enjoying the flexibility of Ujet"
What I Like About You jet is they are constantly thinking about what's their customers want to do with their products. They are always open and available for feedback and have a great foundation for an amazing product. I am able to use you jack for both phone and chat which is really nice as well as have a chat system that is fully customizable. UJET has really helped us streamline our customer support. It is a much more sophisticated system than we were using previously, so it has allowed us to become more efficient and provide better service. I really appreciate our contact at UJET, Courtney, who has provided stellar support and has been very proactive at providing solutions for any problems we have run into. The computers my company uses were challenging to configure to the UJET system. Due to our computers and our internet speed at the time, we had issues with sound/calls at the beginning. When we signed up it would have been helpful to have known these were issues could be components that would effect our experience, just so that we could have been better prepared. However, these issues have been resolved. UJET reporting has helped us get a better understanding of when we need customer support coverage, and that has helped us strategize how we schedule our team. We have also started a new branch of our business, and UJET has helped us to organize our phone lines in the correct manner to support this. "Simple, clean, and easy to use"
One of the things I like best about UJET is the agent facing side can be really easy to use. Additionally, the features on the admin/back-end side are really helpful to monitor and listen to agents. One of the things I dislike about UJET is that the admin/back-end side are a little clunky and sometimes slow. I'll have to restart my browser multiple times to see what I need. UJET has helped make it easier to Live Listen to calls for quality and also, to track an agent's status' and what projects they're working on. "UJET: Client engagement platform All In One"
UJET is not only a solid platform, but the people who make UJET go are phenomenal. I wish there was a way to have UJET on a mobile device. Please give a try you won’t regret it. They are very flexible and will work with you until you’re confortable with the platform. I’m able to fairly divvy out the work load to my team and have beautiful KPI’s to refer to so that we’re running as efficient as possible. "SAAS actually for the modern company"
My favorite part of the platform is it's versatility. Within my team and across my company the common thread is Ujet's ability to adapt and improve it's platform to meet it's customers needs. It's not just the platform however, it's also the people supporting it and their customers. Its a bit new which means there are a few minor features missing. Use it! They may not have all you expect day one but you'll have a partner to get the best solution. Mainly for my team it's gathering the data via their reporting API. They use standard setups which makes it easy to integrate and setup. "Head of Customer Support, but have only worked with UJET for a couple of months"
It is nimble, flexible, and very easy to use from and administrative perspective. The reporting is not available at your fingertips, it requires internal engineering and BI resources to properly gain access to the needed data. UJET has a very open architecture which allows for significant flexibility. The key is to insure you have adequate internal resources and bandwidth to take full advantage of what UJET can provide. Able to launch chat and take advantage of a new communication channel with our customers. My company has just started using Ujet, we previously used another software program. the ease of Ujet is amazing and simple. There are exact hold times provided to the customers. Transferring between departments has become quite simple and there are fewer issues, The software only needs to be installed once and find very few times where we have had technical difficulties. Using Ujet to take incoming and make outbound calls for a BPO. Sometimes a little glitchy, occasionally getting stuck in limbo would require logging out and back in again. UJet has significantly improved the response times and development has contributed to reduced incidences of large queues. [Customer Case Study] Nest collaborates with UJET, improves end-user experience and saves over 25 percent on per-agent licensing and usage. * We monitor all UJET reviews to prevent fraudulent reviews and keep review quality high. We do not post reviews by company employees or direct competitors. Validated reviews require the user to submit a screenshot of the product containing their user ID, in order to verify a user is an actual user of the product. Hi there! Are you looking to implement a solution like UJET?